Quickly overwhelm targets with the speed of motorized dart blasting! 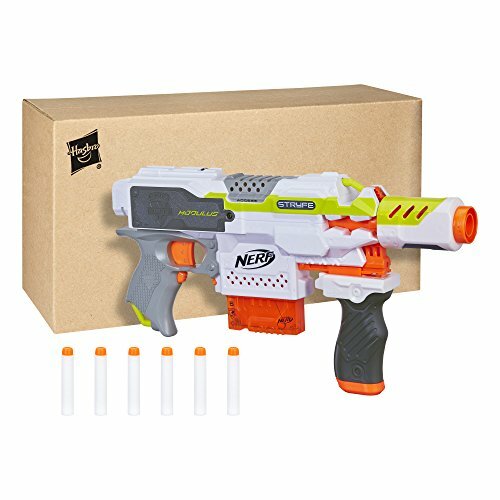 The Nerf Modulus Stryfe blaster lets battlers launch darts with 1-handed blasting and customize for different missions. Hold down the acceleration trigger to power up the blaster’s motor, then take aim and unleash darts with rapid speed. Customize this compact blaster with the drop grip for added stability and the barrel extension for long-distance targeting and additional tactical rails. Includes a 6-dart clip and 6 Modulus Elite darts. Includes blaster, drop grip, barrel extension, 6-dart clip, 6 darts, and instructions. Ages 8 and up. View More In Sports & Outdoor Play. If you have any questions about this product by Nerf, contact us by completing and submitting the form below. If you are looking for a specif part number, please include it with your message. Intex Giant Inflatable Floating Mat, 114" X 84"